No need for 40 different boxes of single serve coffee just to have variety in your flavored coffees. This sampler box lets you choose a different flavored coffee every single time. Choice tastes better with this flavored variety pack. The Two Rivers Flavored Coffee Variety Pack sampler allows you to enjoy a wide selection of coffees without buying different boxes. Unlike any other variety pack available, we give your coffee flavoring it deserves so you can find the perfect flavored coffee k-cups. This Kcups Flavored Coffee Variety pack sampler has 40 count K-Cup Style pods that include: Maple, Chocolate, Cinnamon, Chocolate Vanilla, Pumpkin, Vanilla, Hazelnut and Other Flavored Coffees. Individual flavors may vary. 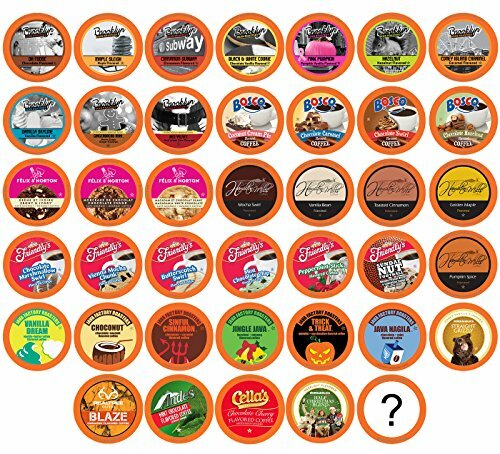 Two Rivers Sampler flavored coffee k cups variety pack style pods are compatible with most Keurig coffee k cups maker, including 2.0 brewers. Keurig Green Mountain Inc. Keurig, Green Mountain and K Cup are registered trademarks of Keurig Green Mountain Inc. Two Rivers Coffee is not affiliated, endorsed, or related with Keurig Green Mountain Inc. If you have any questions about this product by Two Rivers LLC, contact us by completing and submitting the form below. If you are looking for a specif part number, please include it with your message.